Hotel/guesthouse arrangement booking and reservations (air conditioner, free wifi). Transportation arrangement (tuk tuk, car, minivan, bus) including departure and return. Traveling with CBAVC, all distinguished visitors will get the chance of learning and enjoying the fascinating cultures and civilization of this country from our work team and tour guides and also support the vulnerable children, orphans, and disable people with schooling, school uniforms, sport materials, backpacks and bicycles for the poorest, vulnerable and disabled children from families in the region. Sightseeing to archeological, historical sites of the ancient temples. Sightseeing to Eco-tourism resorts and costal resorts (beach). Classical touring programs to the archeological, historical sites of the ancient temples in combination with sightseeing to local villages visiting the real lives of the indigenous people by tuk tuk, minivan, car. Boat trips on the lake to visit floating communities. Cycling tour to the temples and villages. Camping in the jungle, hiking tour programs. Round trips around Cambodia visiting to different provinces, resorts, culture and tradition. Volunteer travel to support the humanitarian causes. 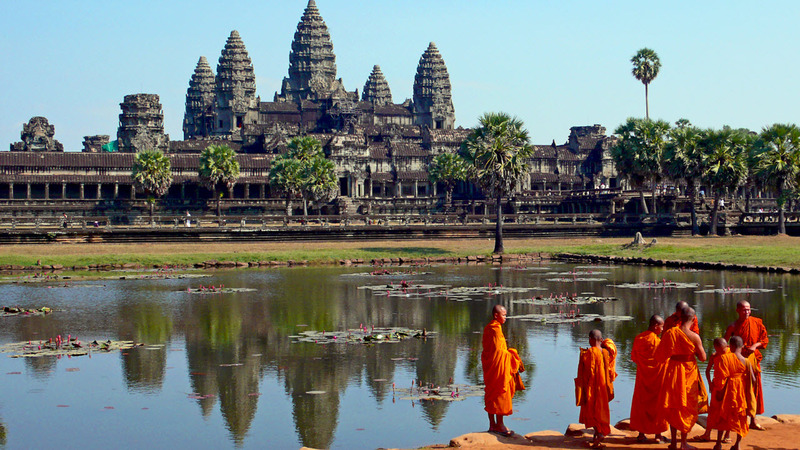 Our visitors will really be interested in visiting cultural and historical sites and heritages existing in Cambodia, the former Khmer’s empire from 9th- 14th centuries especially, the unique historical and archaeological complexes of ancient temple ruins as well as the most well-known temple of Angkor Wat which is one of the World’s Seven Wonders. 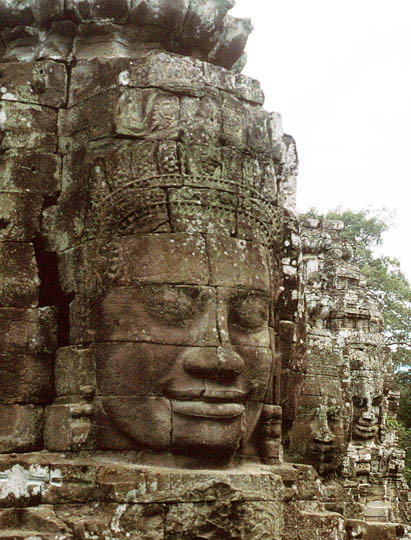 Angkor Thom city, the former ancient capital from twelve century. This is the very capital city which has been surrounded by the great laterite (volcanic stone) and gray sandstone walls measuring at 3 km Angkor Thom city, the former ancient capital from twelve century. This is the very capital city which has been surrounded by the great laterite (volcanic stone) and gray sandstone walls measuring at 3 km square covering on almost 900 hectares of land areas. In the midst of this complex, stands the most favorite Bayon temple showing her smiling faces to the four cardinal direction points. Existing in this same premise, there many other ancient temples such the temples as Phimeanakas, Leperking, Bapuon pyramid, the 12 towers and the Terrace of the Elephants. 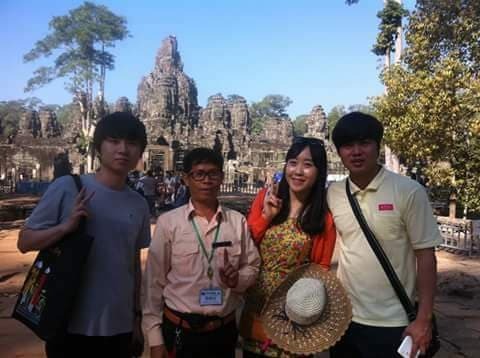 Outside this Angkor Thom complex, there are great deals of other temples such the temples as Preah Khan, Ta Prohm (jungle temple), Banteay Kdei, Neak Poan, Pre Rup, East Mebon, Ta Som, etc, that all of these temples were constructed in different periods from the previous centuries. Outside Angkor Thom city on the distance of 27 km north-east of Angkor areas, there is another one and even the most beautiful temple which is known as Banteay Srei temple that was erected from the late 10th century. This is the unique temple decorated with the most vivid, living and detail carvings throughout the temple structures and the temple itself was constructed from the pink sandstone. All visitors can take photos from many wonderful temples in Angkor regions. House/Guesthouse $35 per night, (air conditioner, free breakfast and wifi). Minivan/Car $45 per day, free cold drinking water. Tour Guide $40 per day. 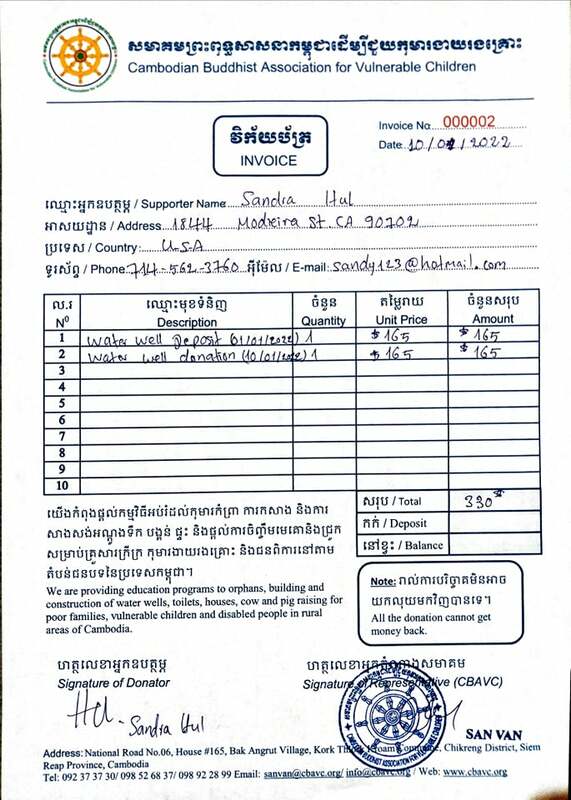 Angkor Visit Ticket $37 per day. Phnom Kulen ountain, some 50 km northeast of Angkor that was established in 9th century under the reign of King Jayavarman II and this was also the place where the king Jayavarman II celebrated his God King ceremony and Hindu Siva’s Linga Cults in 802 AD. This area is composing of the waterfall as 1,000 Siva-Lingas carved on the riverbed and the biggest Buddha image that was carved on the natural stone. 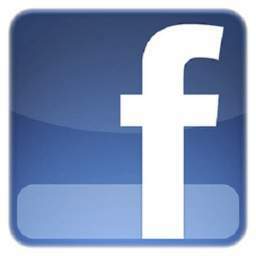 Visit Ticket $20 per day. Minivan/Car $70 per day, free cold drinking water. The natural Tonle Sap Lake is locating about 18 km south of Angkor area. Tonle Sap is one of the biggest and natural fresh water lakes in Southeast Asia. This giant lake is receiving the water sources from the four Principle rivers where the water flows down from Kulen mountain and pours into this lake in the monsoon season but, in the dried season, the water pushes out from the lake to Mekong rivers. Tonle Sap Lake is measuring at about 110 km long by 75 km wide and is also the best sanctuary to the multi-hundred species of the submarine lives and biodiversities existing in the lake. 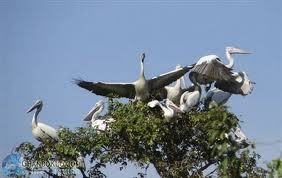 All visitors can take the boat-trip there to see the floating villages, fresh water fish and birds. Boat Ticket $25 per day. Minivan/Car $30 per day, free cold drinking water. 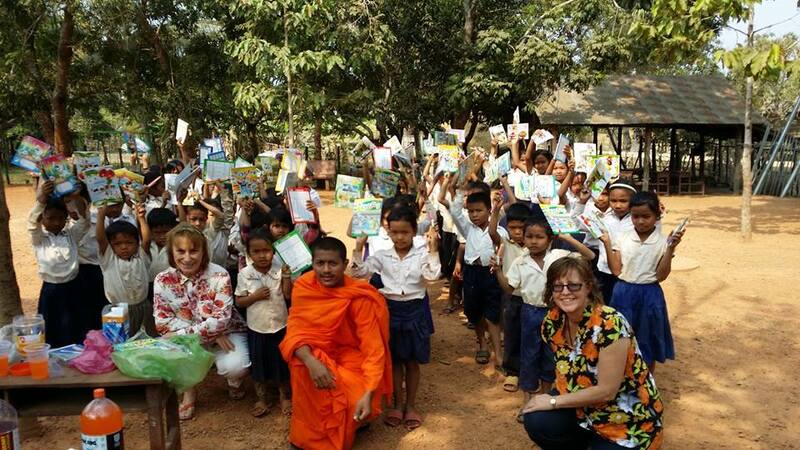 Teach English to children and build water wells in one of the poorest areas of Siem Reap, Cambodia. Help make a difference to local families and in your spare time soak up the delights of the local area and explore the formidable Angkor Wat temples. This project aims to restore hope and dignity to these once-proud and prosperous communities. All visitors can donate funds for the charity projects in the village. Minivan/Car $60 per day, free cold drinking water. 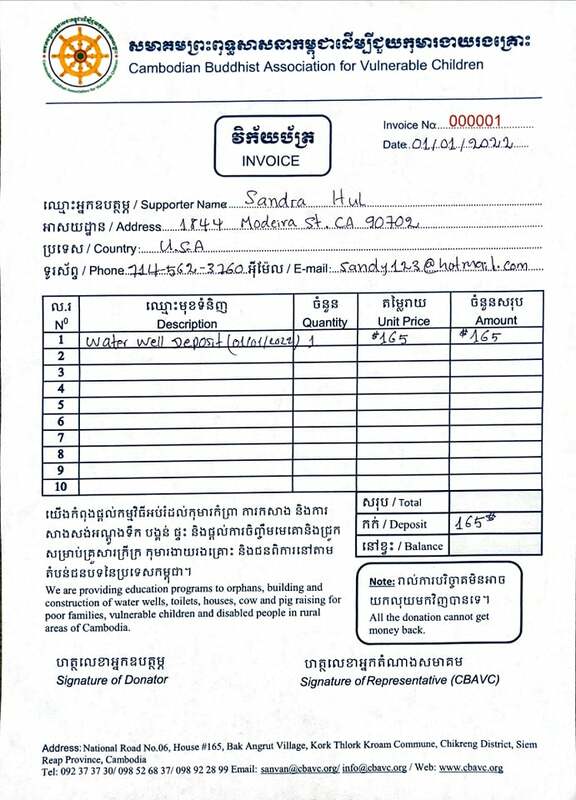 $330 for the Study Materials (books, pens, color pencils) for 250 children, or build a water well in the village. 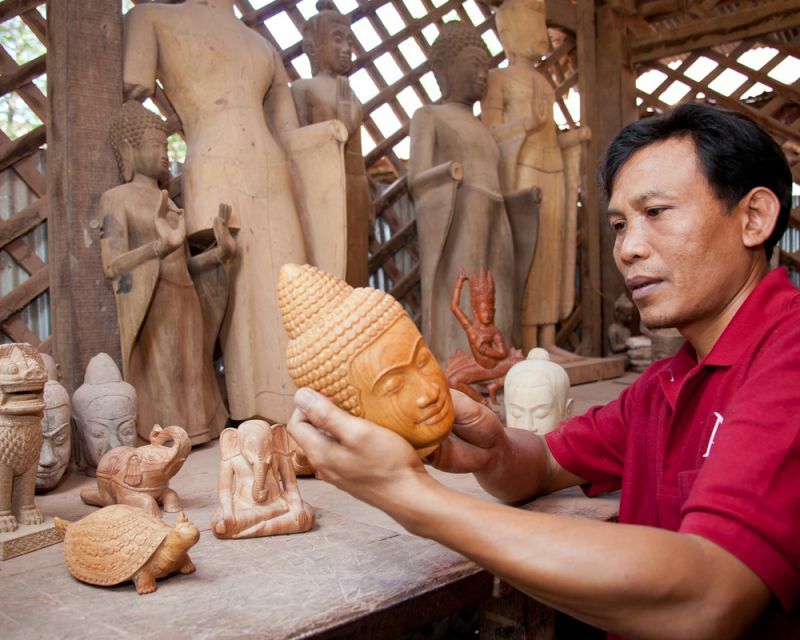 Carving school is in the middle of the provincial town of Siem Reap. 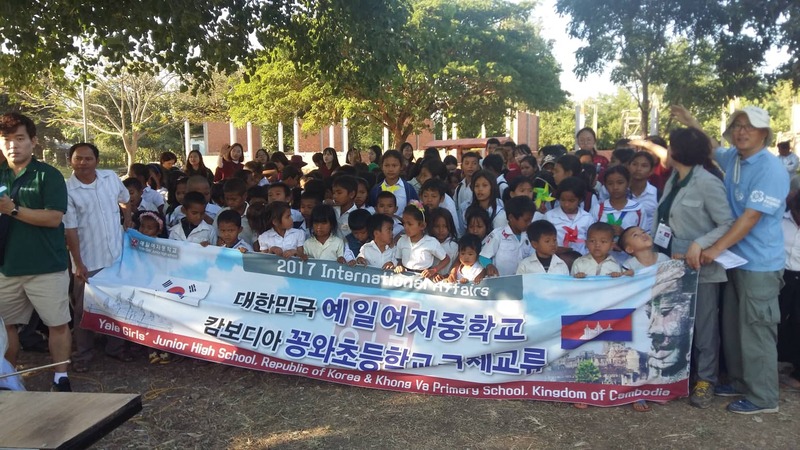 This is one of the NGO-training schools that offer the opportunities to the younger generation who are interested in the arts of carvings especially those who are from the rural areas and the poorest families to attend the professional Find Arts and Silk farm training program under the management of Artisan D’Angkor. From there, all visitors can buy the artifacts or carvings products as the souvenir when returning back home. Thank you. If you have any questions regarding booking, or about any of our tour programs, please do not hesitate to contact CBAVC. We are happy to provide you with any information you need and if you are passing through Siem Reap, we welcome you to visit us!